From the 1840’s through 1920’s, learn about the earlier era of street gangs of NYC and about the evolution from small packs of immigrant thugs with tightly knit loyalties to an evolved, corporate style American syndicate. Mulberry Street, from Chinatown to Little Italy, was the spot where the notorious gangsters in New York came up, from the former Five Points, New York’s most notorious slum, to the narrow alleys Chinatown’s “Bloody Angle.” In Little Italy’s Historic District we learn the ruthless tactics of the first Mafia bosses of New York, the proud efforts of NYPD Liutenant Joe Petrosino‘s fight against these thugs. Organized Crime as we know it was born on these streets. The tour starts promptly at 11am, Saturdays and Sundays at the Southwest corner of Columbus Park (Mulberry & Worth), near the basketball courts, but the story begins at the roots of gang activity in New York City in what used to be its most notorious slum: The Five Points. The history from the 1840s to the 1890s focuses on how the Irish immigrant class rose from the lowest rung of the city's social strata to powerful figures in the police & fire departments and in New York's corrupt political circles. The 1890's is where the Italian and Chinese influence began. A 20-minute walk through New York's old Chinatown is centered around the Tong Wars of the 1890's and the rise of the Chinatown criminal and political class which still run the Chinatowns of New York Today. 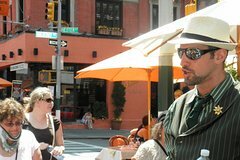 Amidst this voyage through NYC crime history are numerous other significant anecdotal stops about the most notorious Mafiosi to walk the streets of New York, as well as other lesser known citizens on either (or both!) sides of the law throughout New York's long, fascinating immigrant crime story.